Plush Styles: Socks With Loafers, Right or Wrong? With the festive season all gone and the winter very much around in full blast, i'd like to wish you all a very happy and successful new year. I haven't written or put up a post in a few months because of tight schedules and in my subsequent write ups, i will be writing and showing you all what i have been up to these last months, but am back now by popular demand. That said, lets concentrate on the main course today for the men. Is it right to wear socks with loafers? Firstly there are different types of Loafers- Tassel loafers, penny loafers and slipper loafers to mention a few. Loafers are designed as a slip-on shoes and many people will tell you that socks and these slip-on shoes just don’t go but this is hardly practical when its cold and snowing which means weather is a huge factor and also the type of outfit worn. So can you wear socks with loafers? In simple terms, the answer is YES! But it’s very important to pick the right socks. With that said, the type of the slip-on shoe comes to mind. Suede tassels loafers don’t deal with the harsh weather conditions as well as leather, and are much harder to maintain. 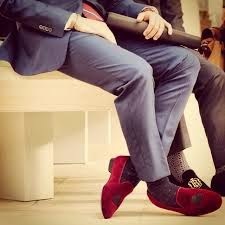 So depending on the weather, put away your suede loafers and get them out in the summer and go sockless when you do. While it's almost like a norm not wearing socks with slip-on shoes, when wearing socks with loafers always make sure they are colorful or patterned ones that compliment your outfit (preferably matching them with an accessory like pocket square or scarfs). Socks with loafers are very stylish if you get it right. It is also very important to consider your style of outfit when wearing slip-on shoes and in this context, wearing it with socks. Wearing tassel loafers with business suits would probably not be considered a faux pas depending on how you combine to pull it off, but I still advice you to wear it with a casual suit or blazer combination, it feels more at home with that look. No matter what you read, a loafer is never a truly formal shoe because of its casual build which is why there's always a debate of wearing socks with it or not but one thing is for sure, when wearing socks with it, make it stylish and worth it. As beautiful as fashion is, the rules are made to be broken so consider it if the weather, your outfit and occasion allow. As always, feel free to drop me an email if you have questions on this or any fashion related topic or drop your comments. Personally I feel there is no reason wearing a sock on loafers. Spoils the beauty kinda.